"Now He Has Appeared in this Beautiful, Dark Bluish Form"
Excerpts from a three-and-a-half hour talk on the history of Krishna’s appearance, given in the actual place where Krishna appeared on Earth, Vrindavan, India by Radhanath Swami. 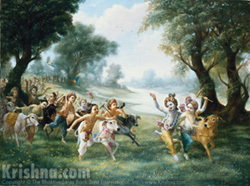 Harinam Cintamani dasi narrates several of Krishna's pastimes. 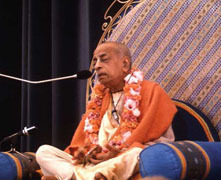 Amala Bhakta dasa narrates the birth of Krishna.